In the late eighties and the early ninties, Tales from the Crypt was THE show to watch if you were a horror fan. Every week they would give you a different story and they always mixed it with dark humor. The show lasted for eight seasons and it is a beloved childhood memory for me. Demon Knight is the first of three movies that would bare the Tales from the Crypt title. There was also Bordello of Blood and Rituals, which went directly to video. Since Demon Knight was the first, it seems like they put all there time and effort into this one. The production value is top notch and the photography is incredibly moody. This looks like it cost more than it probably did. The plot is pretty standard stuff. A loner (William Sadler) comes to a gothic-looking motel looking for a place to sleep. There is another man (Billy Zane) who is looking for the loner and what he is carrying. Both men hold secrets that I dare not reveal here. The movie is set up like a disaster movie with the people in the hotel trying to get out before the demons get them. Of course there is one character who plays Judas by the giving the bad what he wants and then the bad turns around and says "I lied". Like I said, this is all pretty standard stuff, but director Ernest Dickerson knows how to give the movie some flair. There is a scene, for example, that plays out while a comic book flips through pages to show us what happens next. I also liked how there are more than one black character and they don't die first. The performances are pretty standard too. William Sadler is good as the loner and the rest of the cast pulls their own weight. Billy Zane is given the key role of the villain and he chews the scenery apart. It's to bad that Zane didn't go on to become a bigger star because he knows his way around the role of the bad guy. 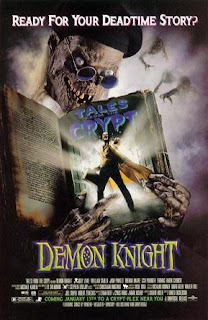 I enjoyed Demon Knight and watching it gave me found memories of sitting in the theater and watching it when it first came out. Watching it now I can see how some parts of the movie don't stand up as they did when the movie cam out, but I accept that. What we have is a pretty good horror movie that is still enjoyable today.